Posted on October 8, 2012, in node.js, php, socket.io, Technology and tagged language php, technology. Bookmark the permalink. 6 Comments. Great and very interesting post! This technique opens to a lot of interesting implementations! Good job and good idea! I only wonder how Symfony Process component really works: suppose you are running a process which will take a while (let me say for instance 2000 ms) to complete, then the “if” statement in the code example below will be executed after 2000 ms or, as the command is executed on a separate process the run() method will fork the command and it will move on the following php statement just after forking (a bounce of ms) and eventually finish the script execution? 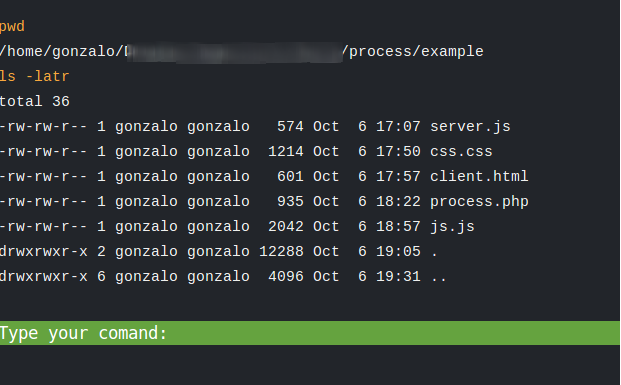 You can get the output of the command in “realtime” without waiting for $process->isSuccessful() using a callback (as I use in the example or the post). But run() method blocks our script. In python for example we can use background processes easily (http://amoffat.github.com/sh/#background-processes), but AFAIK we can’t do it with sf2/process. If you want to run in parallel you need to do it yourself. I will think about it. “The non-blocking feature was added in 2.1. I need to check this feature. I read about it before stable version but I never use. Sounds good. Thanks!